Finding a program is as easy as searching on your local center’s website, a land center’s website, or by going to this page and selecting your region in the first field, and selecting Children/Families in the second field before entering the search. Below are some of the commonly offered programs. 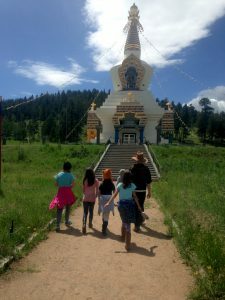 Programs at the Shambhala land centers are rich ways for families and children to connect to the energy of our magical retreat spaces. Programs are offered year- round, and many land centers also offer childcare concurrent with other retreats and offerings. Click on the land center links below to be directed to the program pages for each land center. Shambhala Families and Children’s Programming is about engaging as a community whether we have children or not to support the future of our society. Together, we can create a space for children and parents to connect to their own goodness, wisdom, kindness, and strength.